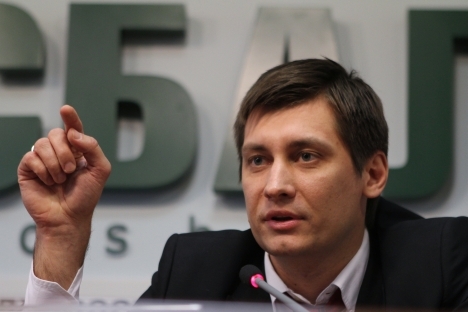 Dmitry Gudkov, a member of the Just Russia opposition party, fell prey to severe criticism by the State Duma for participating in a controversial forum in the U.S.
A member of the Just Russia opposition party, Dmitry Gudkov fall prey of severe criticism of the State Duma for participating in a controvesrial forum in the U.S.
Members of all four factions in the State Duma have asked the ethics commission to give an assessment of Gudkov's participation in an anti-Russian forum in the United States. "In my opinion, what parliamentarian Dmitry Gudkov did demonstrates his disrespect for the requirements set for members of the Russian parliament, negligence toward his responsibilities as a member of parliament and betrayal of national interests," Sergei Zheleznyak, State Duma deputy speaker and deputy secretary of the United Russia Party General Council, told journalists on Friday. A complaint was forwarded to the chamber's ethics commission this morning "after MP Dmitry Gudkov made remarks and called on the American authorities to interfere in Russia's internal affairs during his overseas voyage and attendance at an anti-Russian forum, which was held in the U.S. on March 5," he said. The document describes Gudkov's report at the forum as "strongly-worded, anti-Russian and aimed at discrediting our country." The authors of the factions' request said that "[the report] characterized Russia as an "authoritarian state," where "the authorities took massive reprisal measures against the middle class" and "where criminal cases were fabricated against innocent people who attended a street protest on May 6, 2012." Furthermore, Gudkov's report "describes the State Duma as an "obedient parliament," which automatically adopts all bills submitted by the country's leadership, including "anti-constitutional bills," supports the Magnitsky Act and asks for U.S. support in tackling political problems inside Russia," the MPs said. "We believe that MP Gudkov's statements are effectively tantamount to calls for illegal acts that violate the sovereignty of the Russian state," they said. On March 13 the Sate Duma Deputy was expelled from the A Just Russia party together with his father Genady Gudkov, former deputy of the State Duma. Both were expelled for "actions that damage the party's political interests and image," the resolution of the party's bureau says. A Just Russia leader Sergei Mironov earlier proposed to expel from the party both father and son Gudkov who refused to cease their membership in the Opposition Coordination Council. More than a month ago A Just Russia leadership told the Gudkovs to choose membership in the organization which they want to keep, the Opposition Coordination Council or A Just Russia party. Later, they said that they want to stay in both. Following their decision the Wednesday meeting of A Just Russia bureau addressed the issue of their membership in the party. "All these steps demonstrate MP Gudkov's disrespect for the requirements set for members of the Russian parliament, a planned campaign targeting Russia's statehood, and, in effect, mean a betrayal of national interests, while a member of the State Duma is duty-bound to defend the interests of his country and its voters. We ask the State Duma's ethics commission to consider our request and issue its ruling," the parliamentarians said. Zheleznyak said that he and other MPs view Gudkov's conduct as intentional. "It is Gudkov's planned campaign directed against the sovereignty of our country, while a deputy of the State Duma is duty-bound to defend the interests of his country and its voters. Seeking the foreign authorities' support for one's political struggle is not a new method in political history and it has long been known how it is called," Zheleznyak said. Apart from Zheleznyak, the complaint lodged with the ethics commission was signed by Igor Lebedev, State Duma deputy speaker and a Liberal Democratic Party member, Oleg Denisenko, a member of the Communist Party faction and deputy chairman of the State Duma Security and Counter-Corruption Committee, as well as Svetlana Goryacheva, deputy chairperson of the State Duma Regulations Committee representing the faction of A Just Russia Party. Meanwhile, Gudkov expressed his regrets on a decision made by representatives of the State Duma's four factions to condemn his trip to the United States in a letter to the chamber's ethics commission. "Regrettably, the four factions have turned into one political party, which is interested in advocating the interests of Russian corrupt officials," he told Interfax on Friday. Gudkov said he was certain that these steps would come under strong criticism from people. Members of all four factions in the State Duma earlier asked the chamber's ethics commission to give an assessment of Gudkov's participation in a forum held in the United States.